A government shutdown is avoided for now. The Wall is still in doubt. 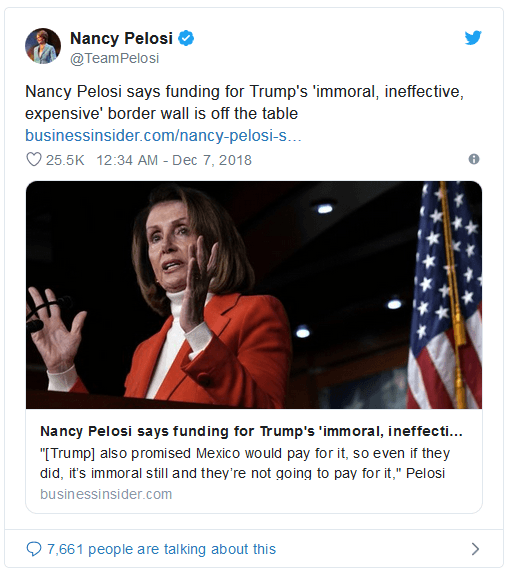 Nancy Pelosi calls the wall immoral. Today, GOP senators introduced the Wall Act. 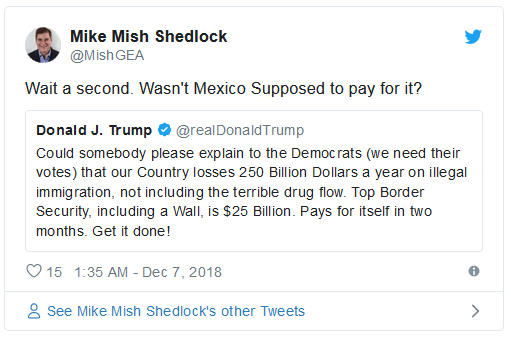 Who's Paying for the Wall? "The WALL Act would fully fund the border wall by closing existing loopholes that provide illegal immigrants with federal benefits and tax credits, without affecting the benefits and tax credits used by Americans," Sen. Ted Cruz (R-Texas) said in a statement on Thursday. "If you want to receive food stamps and other benefits, then you should prove your citizenship. If you cross the border illegally or overstay your visit to this country, then you should pay a stiff penalty," Sen. John Kennedy (R-La.) added. Republicans had a chance to pass the Wall. Now perhaps they don't. 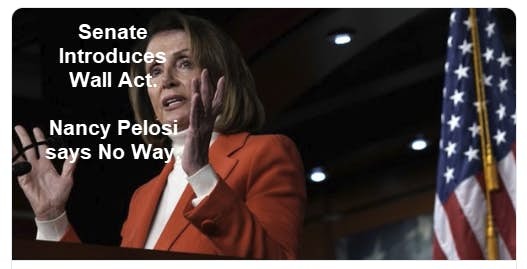 Democrats will be back in control of the House. Meanwhile, as the debate over the wall continues, Congress Passes Temporary Spending Bill. Congress passed a two-week spending patch on Thursday, all but ensuring the government will avoid a partial shutdown this weekend. Shortly after the House vote, the Senate passed the measure on a voice vote extending the government’s funding through Dec. 21. President Trump has said he would sign the short-term extension. Seven spending bills are currently set to expire at 12:01 a.m. Saturday, as lawmakers face an impasse over whether to increase funding for border security. Mr. Trump has demanded $5 billion to build a wall along the border with Mexico, but Democrats have balked. Both Senate Minority Leader Chuck Schumer (D., N.Y.) and House Minority Leader Nancy Pelosi (D., Calif.) have said they would be willing to pass the six less-controversial spending bills and extend current funding for the Homeland Security Department, which oversees the border wall, for one year. The last sweeping spending bill, which passed in March, included funding for new fencing and levee walls, as well as technology, but prohibited the administration from building a solid concrete border wall. Really? Trump won't sign it? Or will he sign it and complain? What's the current definition of acceptable? How is it that a concrete wall is immoral but new razor wire fencing and levees are not. It seems to me we have new definitions of "not acceptable" as well as what constitutes "immoral".